Let's make this winter the season these jackets go out of style. 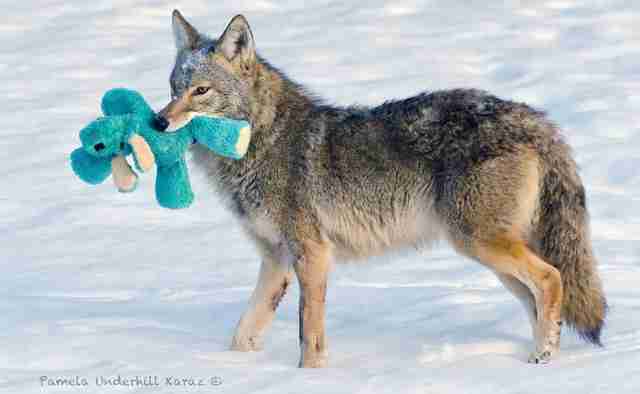 Coyotes don't get a lot of love, even from some otherwise caring pet owners. Canada Goose, an outerwear company that's become insanely popular in the past few years, traps and skins coyotes to use their fur for lining. And their customers - including dog lovers like Emma Stone, proud mom to a rescue golden retriever - don't seem to think twice about who they're wearing. The truth is that coyotes are a lot like our dogs. They crave comfort and safety, they are incredibly smart and social and they can even be silly and playful ... when the mood strikes. Professional photographer Pamela Underhill Karaz snapped these stunning photographs of a coyote who wandered into the backyard of her home in Trenton Falls, New York. 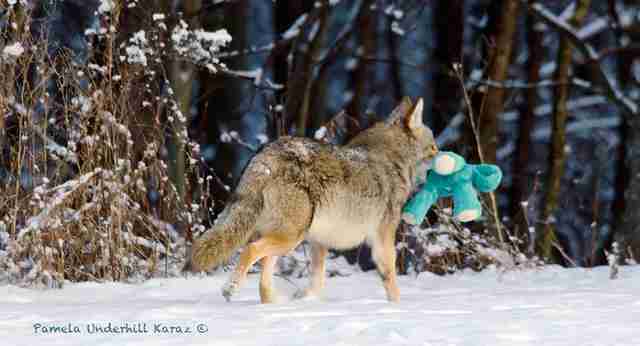 The curious visitor picked up one of the family dog's old toys and, to Karaz's surprise, began playing with it. 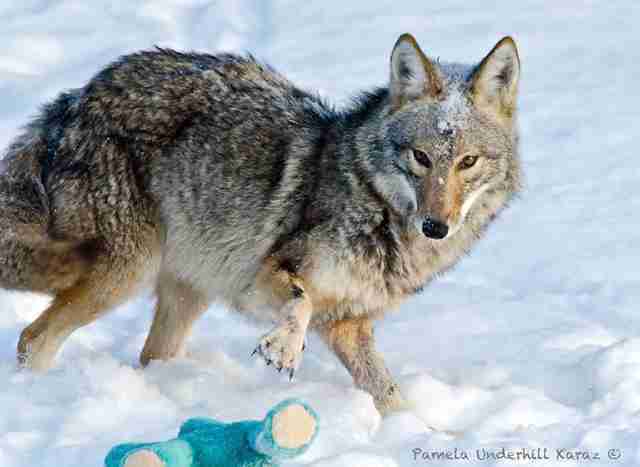 "This silly, playful side of the coyote, a playfulness that we often see in our own dogs but rarely get to witness in wild animals, is such a wonderful reminder that there is more to this canid than the stories making them all out to be villains," Karaz told The Dodo. 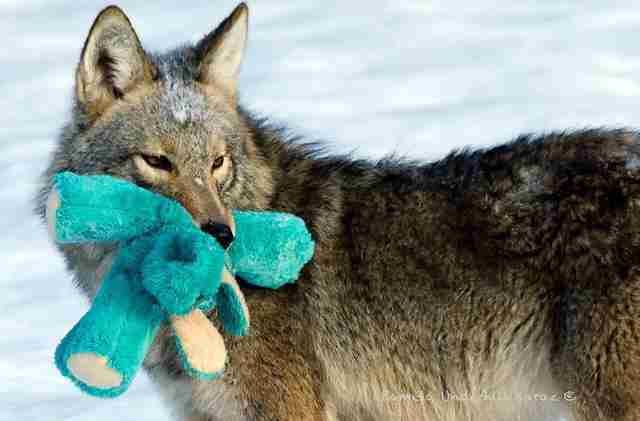 Karaz hopes that these photos of the coyote she and her family have dubbed "Toy Thief" will challenge misconceptions about coyotes. "He has a personality, he has feelings, he does the best he can to survive in what is often an unfriendly world," she told The Dodo, "and, he too likes to play." 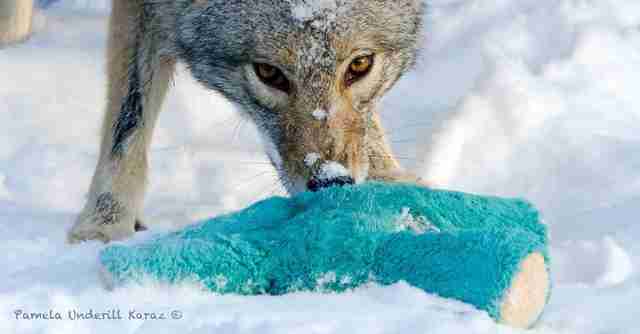 The more people know about coyotes, the less enthusiastic they'll be about wearing one inside their winter coat. Check out more of Pamela Underhill Karaz's wildlife photography on her Facebook page.